A Scott Allan free-kick was enough to earn Hibernian maximum points in a drab encounter at Recreation Park. The midfielder's clever effort found the bottom corner on 26 minutes, lighting up a contest low on thrills. Allan grazed the crossbar with a 25-yard strike in the second half before substitute Martin Boyle forced Craig McDowall into a smart stop. Boyle then spurned a great opportunity late on when he side-footed Jason Cummings' lay-off wide of the target. 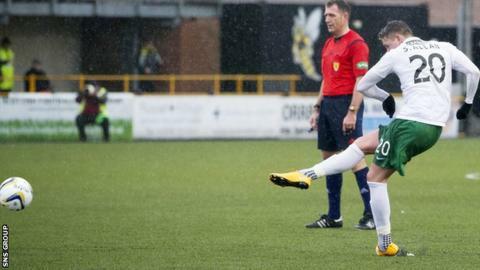 Alloa pushed for an equaliser in the closing minutes but the visitors were rarely troubled defensively as they opened up a four-point gap on third-placed Rangers. The only real moment of concern for Hibs came soon after the only goal when keeper Mark Oxley had to be alert to push away Philip Roberts' deflected strike. Match ends, Alloa Athletic 0, Hibernian 1. Second Half ends, Alloa Athletic 0, Hibernian 1. Attempt missed. David Gray (Hibernian) right footed shot from outside the box is close, but misses the top left corner. Corner, Hibernian. Conceded by Greg Rutherford. Foul by Graeme Holmes (Alloa Athletic). Substitution, Alloa Athletic. Greg Rutherford replaces Philip Roberts. Substitution, Hibernian. Liam Craig replaces Scott Allan. Foul by Liam Buchanan (Alloa Athletic). Ben Gordon (Alloa Athletic) is shown the yellow card. Foul by Ben Gordon (Alloa Athletic). Substitution, Alloa Athletic. Greig Spence replaces Daryll Meggatt. Corner, Alloa Athletic. Conceded by Lewis Stevenson. Corner, Hibernian. Conceded by Mark Docherty. Corner, Hibernian. Conceded by Craig McDowall. Attempt blocked. Fraser Fyvie (Hibernian) right footed shot from the centre of the box is blocked. Graeme Holmes (Alloa Athletic) is shown the yellow card. Substitution, Hibernian. Martin Boyle replaces Franck Dja Djedje. Foul by Philip Roberts (Alloa Athletic). Attempt missed. Scott Allan (Hibernian) right footed shot from outside the box is just a bit too high. Daryll Meggatt (Alloa Athletic) wins a free kick in the defensive half. Corner, Hibernian. Conceded by Graeme Holmes. Corner, Hibernian. Conceded by Jason Marr. Substitution, Hibernian. Jason Cummings replaces Dominique Malonga. Substitution, Alloa Athletic. Liam Buchanan replaces Isaac Layne. Foul by Ryan McCord (Alloa Athletic). Second Half begins Alloa Athletic 0, Hibernian 1. First Half ends, Alloa Athletic 0, Hibernian 1. Corner, Hibernian. Conceded by Michael Doyle.